Has your vehicle been caught in a hail storm? If your answer is “Yes” then Direct Paintless Dent Repair is the fastest, most cost efficient, and preferred method to restore your vehicle back to its original condition. By choosing paintless hail damage removal you won’t lose your vehicle’s factory finish and generally minimize repair time down to 1-3 days. Instead of being without your vehicle for lengthy periods of time. As you may know, repainting your vehicle can cause loss of resale value, errors in paint matching, and paint texture inconsistency. With our PDR process, you wont have to be concerned with any of those potential problems. Using specialized tools, our highly trained PDR technicians apply controlled pressure from the backside of the panel without jeopardizing the chances of any further damage. In short, the metal is skillfully stretched back and forth shrinking the dent until it completely vanishes. Paintless Hail Removal is the least expensive and less time consuming form of hail damage repair. Above all it is the only method that maintains the vehicle’s factory panels, paint, warranty, and most importantly helps ensure the vehicles residual resale value. Please contact us for a free (no obligation) quote. We will work with your insurance company and assist through your claim process. 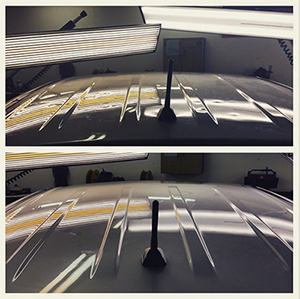 Let Direct Paintless restore your vehicle back to its original pre-accident condition within days, not weeks! Call (866) 984-9434 for a Quick Quote Today! Direct Paintless offers paintless dent repairs in the Bristol and Tri-Cities, TN areas. Most repairs are completed within 1-2 hours. We guarantee your satisfaction or no charge applied!